Spoiler alert: If the villains in a thriller appear to be vanquished with 20 minutes left in the movie, you can bet they’ll make a dramatic reappearance. A case filed by the FTC targets a B2B tactic that small businesses started seeing years ago, but – to quote Poltergeist II – “They’re ba-ack.” And the defendants in the sequel have added what the FTC says is a bogus imposter angle. In years past, small businesses got cold calls from telemarketers who charged outrageous prices for Occupational Safety & Health Administration signs that were actually available free from OSHA. But the modus operandi has morphed, and according to the FTC, Florida-based D&S Marketing Solutions LLC and owner Sean Juhl used it to take small businesses for more than $1.3 million. The FTC says that acting on the defendants’ behalf, telemarketers called new small businesses, claiming to be from the “Occupational Safety and Compliance Administration,” “Office of Compliance and Safety Standards,” or some other OSHA sound-alike. The caller said the business was in violation of federal law and had to pay $180 or more for certain government regulation posters to display in the workplace. If the company didn’t cough up, the caller threatened that the “agency” would be arriving posthaste to inspect the premises, assess fines, or even shut the place down. The FTC’s lawsuit alleges that the defendants falsely claimed be affiliated with OSHA or another government office and misled businesses by stating or implying that companies had to buy the posters from them to comply with the law. In fact, businesses can simply download the posters from OSHA’s website or call OSHA’s 800 number for free copies. The FTC also alleges that when businesses tried to return the posters and get their money back, no one answered the phone at D&S, their messages went unreturned, and many buyers never got a refund. The lawsuit is pending in Tampa, where a federal judge just entered a temporary restraining order at the FTC’s request. If the defendants’ sales tactics sound like the imposter scams the FTC has been warning consumers about recently, that’s because the similarities are striking. The FTC has new resources to educate consumers about imposter scams – everything from fake demands from the IRS to those staticky calls claiming that a family member will languish in jail if bail money isn’t wired immediately. A two-minute heads-up at your next staff meeting can save your company time, money, and aggravation. A lot of the FTC's advice for consumers about spotting imposter scams can be easily adapted for a business audience, including videos and a graphic novel (also available in Spanish). Ask your HR team to alert new employees to imposter scams and pay special attention to training the people who answer your office phone. Pass a warning along through your industry trade association or local business owners group. Use your social networks to share the FTC’s tips on how to stymie imposter scams. It’s easy to mention an official-sounding office, spoof a government phone number, or cut and paste agency letterhead. If your company is contacted out of the blue by someone who says they’re from the government, take the time to call the agency directly at a number you know to be legitimate. (The fact that callers use the names of real government employees is no guarantee they're legit. Scammers have been known to exploit that tactic, too – including by dropping the names of FTC staffers.) Most local, state, and federal agencies are aware of imposter scams and will understand your need to verify. Until you’ve double-checked, don’t share your credit card number, Employer ID Number, or other confidential information. 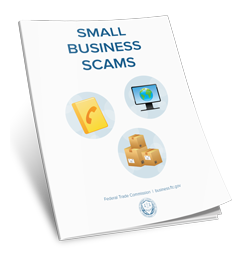 For more tips on protecting your company, read Small Business Scams. This happened to me last week. The woman identified herself as being from the US Federal Compliance Agency. And threatened that if I didn’t get in compliance by paying $189 for the signage I could be subject to $35,000 in fines. Fortunately I smelled scan and verified it here. This just happened to me today, and unfortunately I got scammed. They used the same tactics of suggesting that my business will be fined $35,000 if not in compliance. They told me that they will stop the audit, since I am now registered. I was busy with a customer and not being focused; I gave them my card info and I was charged $189. I was not able to place a stop payment since it was a debit transaction. The transaction shows up as US Federal Compliance, but when asked for details from my bank, it says that it is from Misc. Specialty Stores. Hope this helps prevent someone else from becoming the next victim. You can help law enforcement by reporting this at www.FTC.gov/Complaint. The information you give will go into a secure database that the FTC and other law enforcement agencies use for enforcement.